This entry was posted on March 8, 2013 by Sports Traveler. Seriously, is there anything better than the NCAA Tournament? Throughout the world there are sporting events that capture excitement and majesty in the performance of excellence. Some say the Super Bowl is the greatest event. Others might contend that the Olympics or the World Cup represents the best that organized sport has to offer. A fan representative from every major sport could file an argument for their sport's top event. Most times we are consumed with professional athletes and for good reason. Pro athletes are at the top of their game and talent levels across the board are much higher than that of any amateur league. However, there is just something special about college basketball. Sure some of the pageantry has been lost over the years from players leaving college early. And yes there are a litany of dirty coaches in college but at the end of the day these players should be allowed to receive compensation. Tax friendly of course. The only obvious problem is the disparity between schools and the pocket books of their boosters. But until the NCAA cleans up their act that is a conversation for another day. For now we just get to enjoy the amazingly competitive basketball we have had the pleasure of watching all season. In honor of the tournament and its eventual destination, Final Four (Atlanta), I will present you with a few stories of travelers who have been to the Final Four. These are just a few excerpts from stories that I have heard over the years as a fan and as a professional in the business of sports and travel. One repeat traveler with our company remembers how he twice ran in to Bruce Weber at the Final Four. 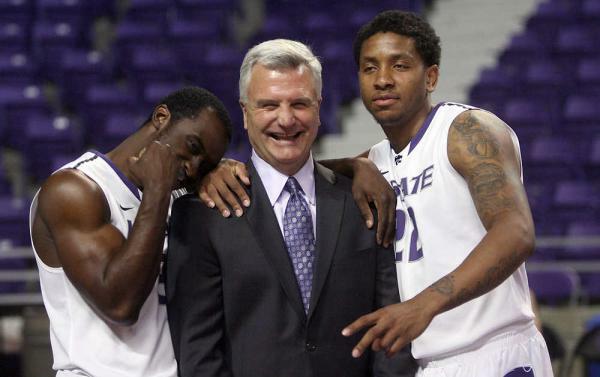 Bruce Weber is of course the current head coach of Kansas State and former coach of the University of Illinois. This particular fan was in downtown Indianapolis and remembers seeing a man pounding on the hood of a car to gain the drivers attention. When the fan looked to survey the commotion, he noticed it was head coach Bruce Weber. The fan was from Chicago so he knew very well who Bruce Weber was. The following year the same traveler was walking down the street in Atlanta and was wearing an Illinois hat. Someone yelled at the our traveler, "Go Illini". When the traveler turned to look he once again noticed that he had crossed paths with the raspy voice of Illinois head coach Bruce Weber. It is stories like this that I love to hear from people who have been on one of our trips. A fun little occurrence where the world doesn't seem so big after all. Our next story also involves coaches and it took place last year in New Orleans. This traveler was waiting to meet to people in the lobby of the Hilton Riverside when he caught a glimpse of several college coaches. While waiting in the lobby our traveler noticed a group of men walking through the lobby wearing athletic gear and team apparel. The traveler quickly noticed hall of famers Coach K and Roy Williams. Although the fan did not care for Duke or North Carolina, he still enjoyed the experience and thought it was "pretty cool" to see a couple of active legends in college basketball. An experience he said he will never forget. As a fan I recognize how special events like these occurrences can be. Sometimes its just the random experiences you encounter on a trip that can create a memory for life. As a professional in the business it helps me truly appreciate what trips like this can offer to a fan. Some experiences are simply priceless. We have arrived at the door of March Madness. A few conferences are playing their tournaments now and the rest will join in next week. The anticipation is building and fans everywhere have already envisioned filling out their brackets in hopes that this year will finally bring the fruits of a bracket victory. I know I can't wait. Get ready folks the wild ride is coming and there is no way to tell how this one ends. At this point there is still a lot of work left to find out who makes the cut and who watches at home this year. Enjoy the next couple weeks basketball fans!